What would you plant in this garden? The only plant in this garden is a native orchid and it grows really well. To give you an idea, the garden faces north, it has a number of very large rocks in it that go underground and generate a lot of heat in the summer. 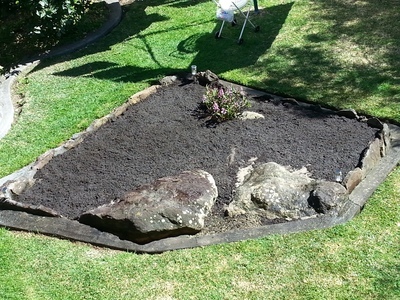 The garden bed gets full sun for most of the day during spring and summer, but less during winter and autumn. The garden is situated in Sydney about 10 km from the coast. If this was your garden what would you grow in it? There are various plants that are heat and sun exposure resistant that still display a lovely lush appearance. Stick to natives, and stick to the natives for your area. I would plant a variety of taller plants to add shade and coolness, and then you can experiement with flowers etc using the canopy of shade you have created. The heat from the roxks will decrease with added vegitation. 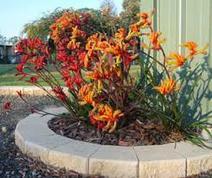 I cant go past native wattles, bottlebrushes and kangaroo paws. They encourage bees, birds, flower regularly and are so Australian. I would plant some birds of Paradise. If that doesn't work maybe some fruit and veggies. Do you have a favourite rose? Have you ever had a bird poo on your head? What is the best sized TV to watch sport on? Do you plant on your nature strip? What's wrong with this vine leaf?